Validotz are graphene quantum dots made from plain and simple coal for use in optical, medical imaging, bio-med, sensing, electronic, photovoltaic and monitoring applications. 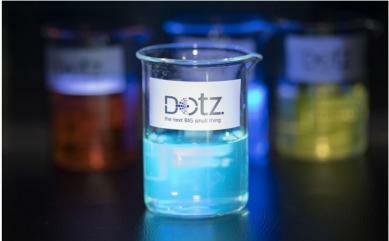 According to Dotz Nano, in contrast to classic silicon quantum dots, the alternative graphene-based dots are biocompatible, photostable and inherit superior thermal, electrical, and mechanical properties. Dotz Nano says its innovations are “causing an uproar” in the advanced material market with previous orders into China and potential orders in Australia potentially on the horizon. According to Dotz Nano, its most recent Validotz order totals 10 kilograms of violet and blue Validotz to be distributed by Pflaumer Bros. in their official capacity as a distributor. The planned application for the order is for pilot productions to a variety of customers in industrialized sectors, namely nylon, concrete, floorings, poly-resins and thermosetting materials. The order is expected to be distributed to customers within the upcoming two weeks, the company said. Dotz Nano hopes to enlarge its market presence by supplying its products to various companies across a broad range of sectors including medical imaging, sensing, consumer electronics, energy storage, solar cells and computer storage.